WILMINGTON — Wilmington College students interested in the study of law will have an opportunity to test their skills in a mock trial exercise before a real judge in a real courtroom Monday, April 22 at 6 p.m., in the Clinton County Courthouse. Judge John W. “Tim” Rudduck of Clinton County Common Pleas Court will judge the simulated trail in which the plaintiff in the fictitious case is a television show suing an animal trainer after a producer is killed by a chimpanzee. The activity gives members of the mock trial team an opportunity to showcase real-world lawyering skills in a civil negligence case authored by the American Mock Trial Association. Rudduck will announce the winners and present awards. Team members include Anton Berglund, Jayme Mabry, Kelly Johnson, Parker Gunkel and Shelbi Mays. Katie Wright, assistant professor of criminal justice, coaches the mock trial team, which also received assistance from Dr. Paul Moke, professor of criminal justice and political science. They have been working with the team throughout the semester in developing core skills for conducting opening and closing arguments, direct examinations, courtroom etiquette and arguing the rules of evidence. 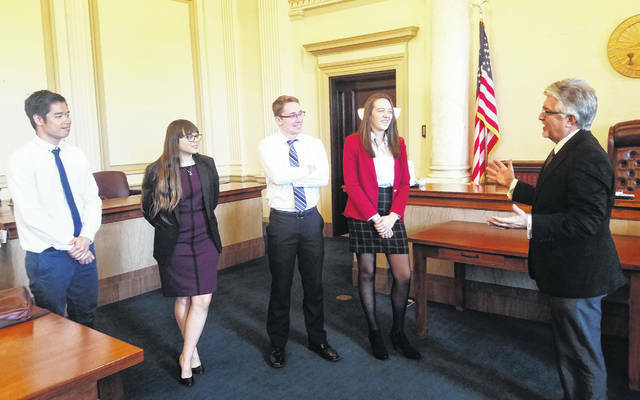 “Taking a case to trial in a real courtroom is a wonderful opportunity for the students to put into practice what they’ve learned,” said Wright, who formerly worked as an assistant prosecutor in Clinton County. “These are high-level skills that will serve them well regardless of what career path they choose.